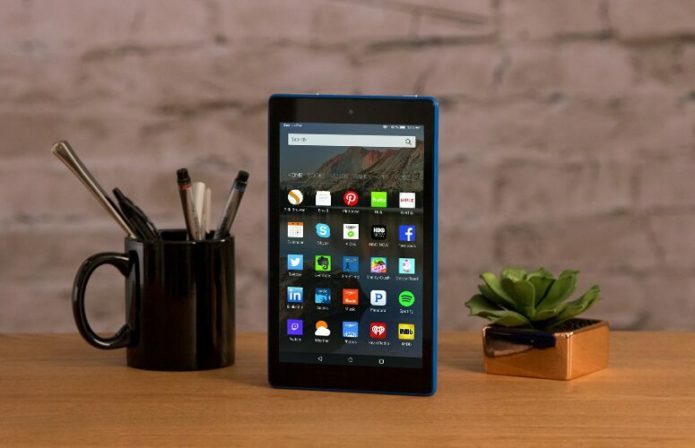 If you need a bare-bones media tablet that won’t break the bank, then the Amazon Fire HD 8 with Alexa is perfect for you. This refreshed model has Amazon’s Alexa AI assistant on board and continues to offer great battery life and fairly smooth performance. The lack of Google apps such as Gmail and the Chrome browser is a drawback, but with a starting price of $80, this 8-inch tablet is hard to beat for your entertainment needs. This year’s version of the Fire HD 8 comes in Black, Canary Yellow, Marine Blue (the unit I’m reviewing) and Punch Red. These brightly colored shells coupled with moderate-sized bezels give the device a youthful appearance that can show off your personality. Meanwhile, the Fire HD’s matte plastic back is easy to grip and makes this tablet feel durable.